We had a busy week and lost some of our regular school time on Tuesday (dentist appointments! ), so rather than feel like we were playing catch-up all week, I decided to skip the majority of our science lessons. We were supposed to grow mold this week…and I just didn't want to deal with it. I know, I know, bad mama, right? Don't worry, Miss M won't let me get away with not doing it at all. I'm sure we'll do it some time down the road! While we didn't do much in the way of (scheduled) science, the kids had a blast examining the bones of a possum we found last year. They tried to guess what the different bones were (skull, mandible, vertebrae, ribs, scapula, teeth) and even pretended to put them together in some really kooky ways! Unfortunately I didn't take a picture 'cause I was busy doing dishes while they explored. A brother and sister who love each other! In history this week we learned about George Washington and the beginning of the Revolutionary War. We made Johnny Cakes and ate them with Bean Pottage (with bacon!!) and mustard greens. It was a delicious meal! 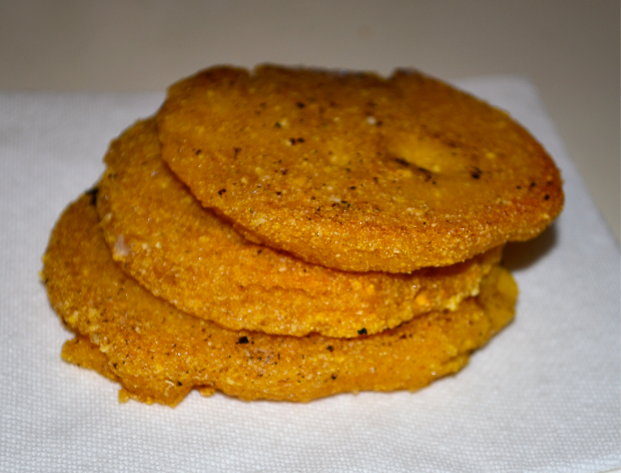 The Johnny Cakes were really easy and good…I'll be making them again! Miss M is doing very well in spelling. Though I should mention that we haven't been using Spelling Power quite as it is intended. Since Miss M is only 6, she doesn't quite have the muscle strength and control to do a lot of writing each day. Some is okay, but not too much. When we do spelling, the writing often gets in the way of what she knows, either by being illegible (usually due to laziness/frustration rather than lack of know-how) or by causing her to either skip letters or duplicate sections of words. I find myself in a bit of a conundrum. She knows how to spell advanced words, but she's not ready for advanced spelling methods. I know the motor skills needed for lots of writing will come because she does a lot of writing and drawing in her free time. In the mean time, we're doing all our spelling words orally. When she misses a word (ranging from 0-3 a week), we do some visualization exercises which seems to work really well for her. I ask her to close her eyes and visualize the word "on the paper in your mind." Then I spell the word for her and she "sees" it in her mind. She does amazingly well this way and can usually correctly spell the words she has missed any time I ask her in the future. Obviously this method is not going to work for everyone. Miss M seems to be hardwired to understand spelling and reading without much outside input. It's up to me to meet her where she's at and give her something that is challenging but not frustrating. I'm constantly having to re-evaluate what we're doing and not get stuck into a rut of what is "expected" or the "usual" way of doing things. Why is it so hard to keep a secret in the bank? Because there are so many tellers. It snowed again this week. In May. In Missouri. Some areas around us broke 106 year records! I felt so bad for the poor hummingbirds out trying their best to stay warm! Perhaps it at least killed off the ticks that didn't seem to be bothered by last year's drought? A poor Ruby-Throated Hummingbird visiting my feeder while it snows. 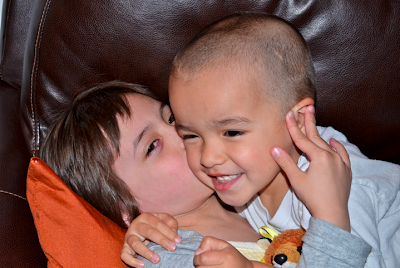 To raise our spirits during the resurgence of winter weather, I gave the kids fresh new haircuts! Hubby cuts his own hair, so here are my three darlings all fresh and clean-cut! Miss M, Hubby, and Little Guy all sporting new haircuts. After commenting that she could feel it fluttering in her hands, she decided it would be kindest to let it go so it could get back to the work of finding nectar and laying eggs. Good choice, Miss M! We're very excited to begin our study of the states next week!